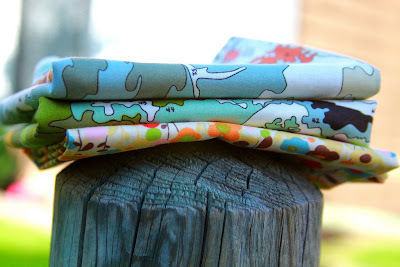 Go say hi to Darci over at Stitches and Scissors ... she's hosting a great giveaway of some of my favorite new fabrics ... "Wonderland" and "Lush". This stuff's hard to find, but she's giving some away! Tell her Quilt Dad sent'cha. Thanks to everyone who's been emailing me about the Quilt Arts debacle. As you know, I wrote a brief post a few weeks back sharing the news of the great sale that was going on. Of course, I have no affiliation whatsoever with the site ... I was just trying to spread the good word. Well, it seems as though the store has gone under. Check out the site announcement here. Fortunately, I've read that a lot of folks have received either their full or at least partial orders. But I (and many others, it seems) haven't received anything yet. So far, it seems as though people have only been charged for what was shipped to them. I'm off to check my credit card statement to make sure it's clear. I can only suggest that you do the same. I am very sorry for spreading what now appears to be bum information ... I now wish that I hadn't posted anything at all about the sale. I'll chalk it up to a lesson learned! I don't think you need to apologize for spreading the word about the sale - that's how Quilt Arts had it advertised, you were just passing along info. And I'm not even sure their advertising was misleading...what was misleading (or maybe we just all assumed) was that they had sufficient stock of all of the items posted on the website. So I think that's the upsetting part for most people, me included (thought I was going to get Kona @ $3/yard). Please don't apologize or hesitate to pass on sale information! I was so disappointed when I read the statement last night as I have not received anything. I do think that the company is very dishonest if they would run a sale like that and then close the doors when they ran out of stock. Who does that??? anyway, thanks for the updates! As regards to that sale thingy don't stress who would have known?!?!?! I always appreciate when people tell me about a sale, so I think it is all good. No apologies necessary for the sale announcement. If it makes you feel better I received my order very quickly and it was only missing one item for which I wasn't charged. No biggie for me. I'm actually disappointed to hear they're finished. I thought it was great service. I am thankful you did pass on the info for the sale. I am new to quilting and wanted to build up my stash. I ordered over 30 items and received 29 and was only charged the 29. I double checked my list and the reciept. Thanks for passing on the info and I do hope you continue to pass on info on sales. You owe no apology. You were just passing on what looked like good news for the fabricaholic in so many of us. My order # was past that cutoff #, and there's no charge on my credit card, so that's that. Please continue to pass on sales and specials you find. We can never have enough. I, too, placed a (rather large) order and received about 2/3rds of it. Like Michelle, I was disappointed about the Kona. I got most of it - but not the Snow that I really need. So, it sounds like some of us still got some great buys. No need to apologize about the sale. I'm sorry you didn't receive your order. I guess I was lucky and got about 2/3s of what I ordered, and was only charged for what was sent. I was happy for what I got anyway. I hope Leslie comes out of the woodwork! First off, I agree with everyone else, NO need to apologize!! For those of us who actually received some if not all of our orders, we thank you for the heads up. :) My order# was after the cutoff number but I received everything I ordered. And John, I still love your quilting! I didn't enter the pillow giveaway but they were great! Add me to the chorus of don't be apologizing -- you were passing on legit information! Thanks for adding my shop's button to your blog! So nice of you! Just my two cents, but I always want to know about a sale. Unless you were an owner or psychic, how in the world would you know. Keep up the great work on the quilts and the blog. I didn't get my order and apparently was not charged either. No Harm, no foul. I love to hear about a good sale. It wasn't your fault. We still love you! He? did you say "He" ???? I know what he you are talking about and it's not me. Everyone else has said it but I'll say it again. No need to apologize. I got two of three things I ordered and I didn't get charged for anything I didn't order. But it does make one wonder! Funny, I got my stuff but my friend didn't get hers and she tried to contact them several times, to no avail. Anyway, it is not your fault so don't feel bad. No way you could have known. No worries. No problem on the sale, I knew it was too good to be true! That didn't stop me from placing a HUGE order, oh well, I guess we are back to cutting fat quarters! It is always good to pass information along in a blog. I welcome it! Congrats to Leslie!I am really enjoying your blog. With the price of fabric I really appreciated your letting us know about the sale. But honestly - my guess is that we can all live without new fabric ( at least for a little bit). 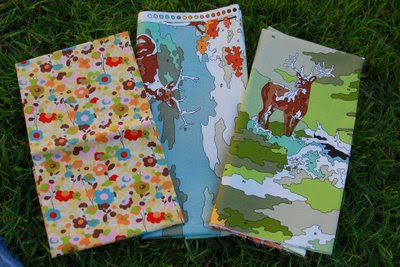 I think it's the thrill of finding the bargain and looking at fabric that I love. So now I'm going to go make something from my stash. I agree.....no worries. I ordered, didn't receive and was a bit weirded out about having my credit card number in their files. So I called the bank and will have a new card issued. You had no way of knowing, and I appreciate it as one of the apparent few who DID get something (four out of seven picks). At least I got a good deal on some stuff! So I'm pretty happy you listed it. Poor shop. Hard times. Thanks for stopping by my blog to enter the doll quilt giveaway! I just realized after reading some more of your posts, that you're living in Cary, NC! We live in Indiana, but our very best friends live in Holly Springs and just moved from Apex! I was just in Cary a few weeks ago when we went for a visit. Beautiful area! oh that is just so sill(ahem)ee!